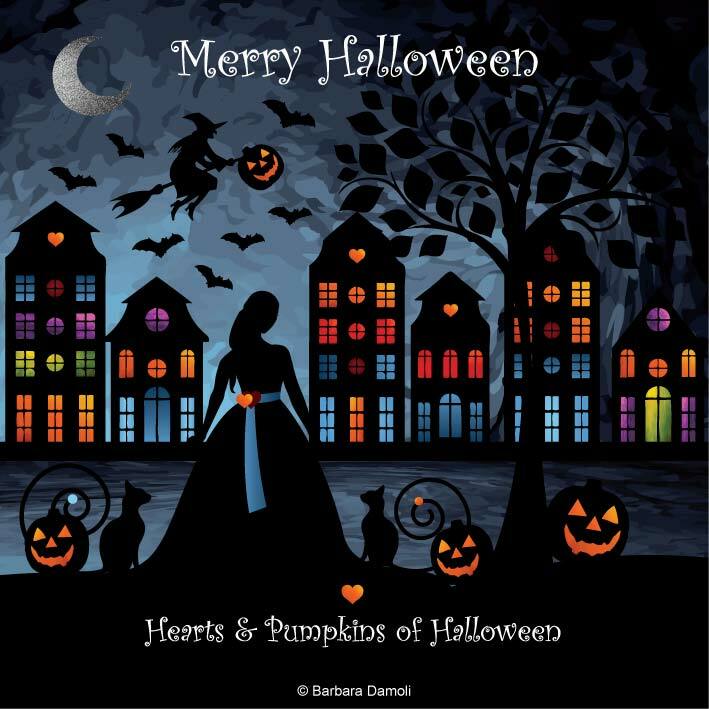 Merry Halloween Card, 12 x 12 cm • FREE til October 31st 2017, FOR PERSONAL, NON-COMMERCIAL USE. This year, on the occasion of the recent opening of Art Online Shop, I decided to create a new Merry Halloween Card. It’s a little gift, to Art Online Shop’s customers and visitors, so it is FREE for personal, NON-commercial use. For a really Spooky and Merry Halloween, I also enclude a Link to a Halloween game which you can play for FREE. Today this holiday is seen a as cozy moment, warm colors and lights, in this time of the year, when the days are getting darker and colder. However, the origines and and myths of Halloween are not cozy, but very mysterious and fascinating. The earliest trace of All Hallows Eve, dates back to over 2000 years ago, in United Kingdom. Halloween is on October 31st, that was the last day of the Celtic calendar. In fact this celebration was related to the Celtic New Year, called Samhain and meaning “summer’s end”. All Hallows Eve was a pagan holiday, marking the end the old year and beginning of new one, as wel as honouring the dead. During the transformation from paganism to Christianity, the celebration of the Celtic New Year, was incorporated into the new religion. In Christianity, Halloween is corresponding to “The Day of The Dead”, the evening before All Saints Day. These days are particularly important, for the Catholic part of Christianity. The myths around Halloween, created the element of magic and fascination, which still lives to this day. In ancient times people believed that the souls of the dead roamed the streets and villages at night. Since not all spirits were thought to be kind, gifts and treats were left around, in order to quite the evil, in the hope that next years crops would be plentiful. During the years, such belif evolved into the trick-or-treat tradition, which we know today.